Up to this point, I have blogged exclusively about vegetable gardening, but that’s not the only kind of gardening I enjoy. In fact, the spark that rekindled my love of gardening was my butterfly garden, which I started a little over a year ago. This evening, after returning from a few days out of town, I was struck by the simple beauty of some of the flowers I have here and there around my house. My iPhone, which has a remarkably good camera, was conveniently located in my pocket, so I decided to turn my walk-around into a photo shoot. I liked some of the results so much, I was inspired to write a blog post so I could share them with you. Because my butterfly garden is in a way responsible for all this, I will give a selection of those flowers top billing here. The first two pictures to share are milkweed. Milkweed flowers will attract just about any nectar-feeding insects, including multiple species of butterfly. What makes milkweed a central component of any butterfly garden, though, is that it is the only plant that can serve as the host plant for Monarch caterpillars. As such, Monarch butterflies are particularly drawn to them. 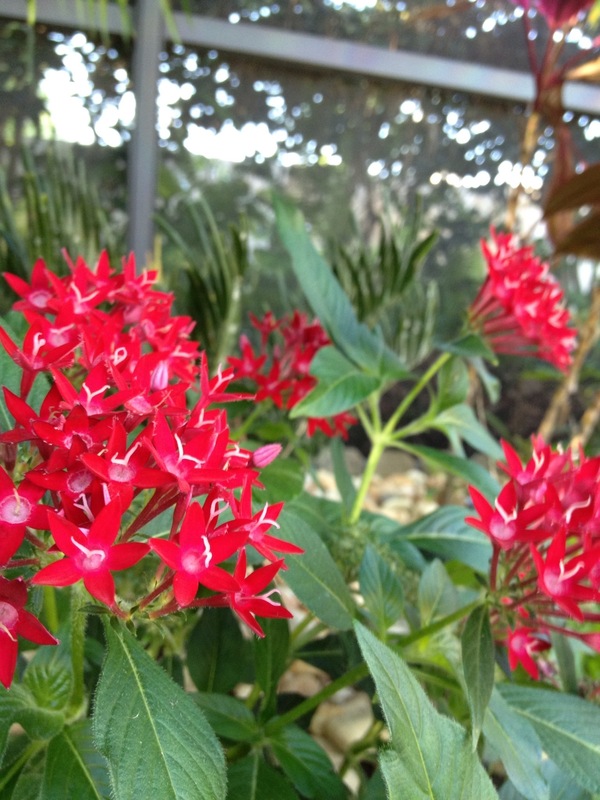 The picture above is a scarlet milkweed, asclepias curassavica, also known as a tropical milkweed. This is the typical color pattern for that species. The one below is somewhat of an enigma. About a year ago, I purchased a butterfly milkweed, asclepias tuberosa, and planted it in this spot. It promptly died. What you see is the plant that grew up in its place. 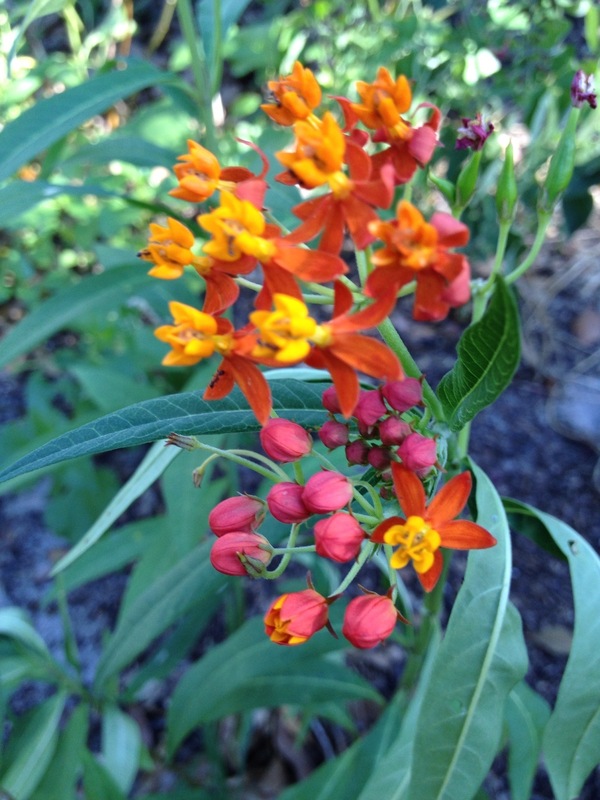 A typical butterfly milkweed flower looks similar to the scarlet, with red and yellow, giving it an orange appearance from a distance. The easiest way to distinguish the two species is by the leaves, as the butterfly milkweed leaves have a somewhat crinkly appearance, whereas the scarlet leaves are smooth. 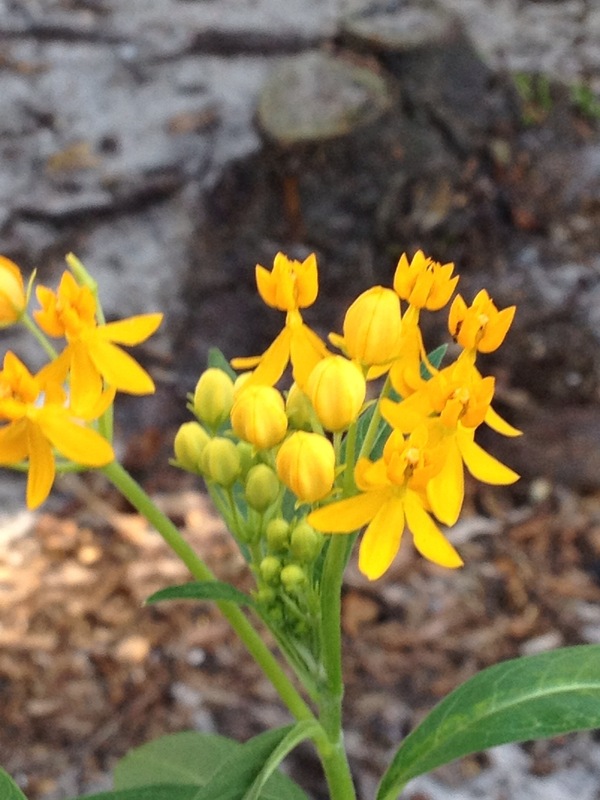 All-yellow flowers like you see below are a known variation of butterfly milkweed, but the leaves on this one look like those of a scarlet milkweed. I suspect this is actually a yellow butterfly milkweed, and if the leaves become crinkled as the season progresses, I’ll know for sure. For now there is that element of doubt. 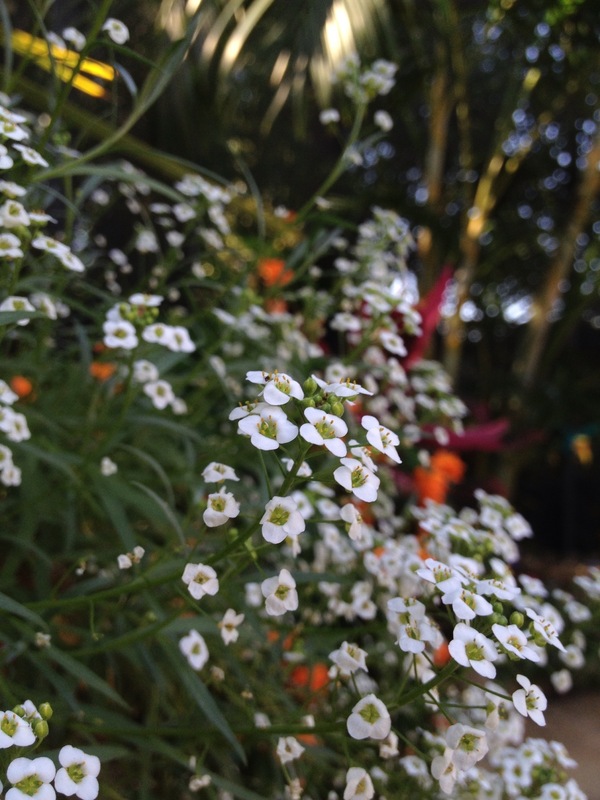 The two pictures of daisy-like flowers below are strictly nectar sources in my butterfly garden. That is, they do not serve as larval hosts; they merely help attract and feed adult butterflies. 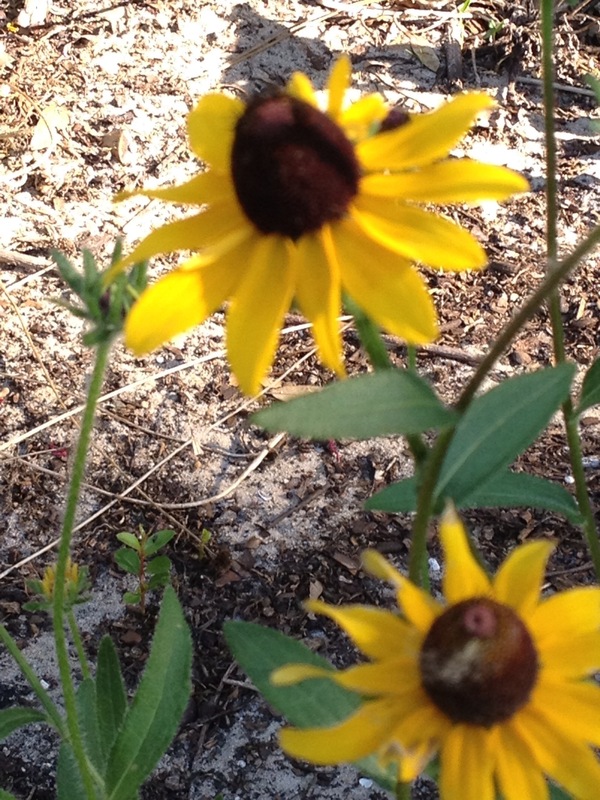 The first picture shows some of Florida’s state wildflower, the coreopsis. 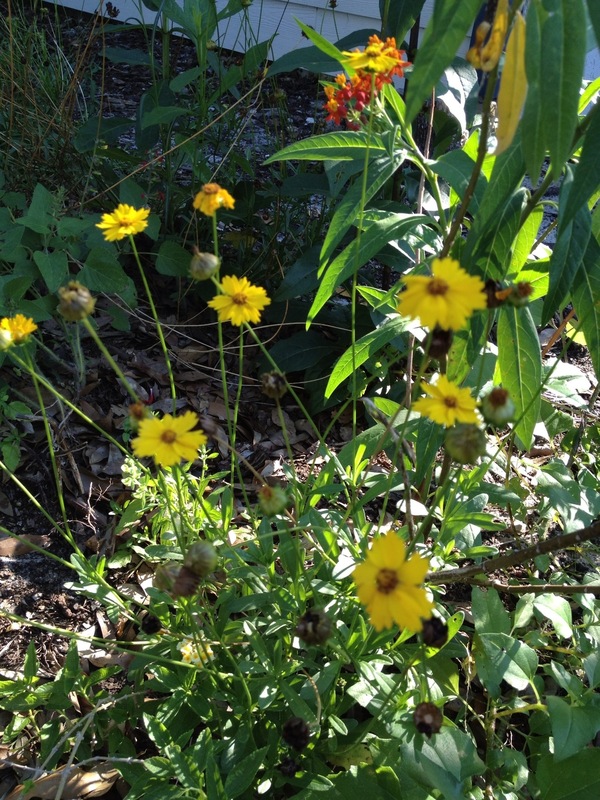 If you can remember the common name, coreopsis, it’s easy to remember the scientific name of the genus, coreopsis. This particular species is the C. lanceolata, so named because of its lance-shaped leaves. The second picture shows a couple of Rudbekia hirta, better known as Black-eyed Susan. 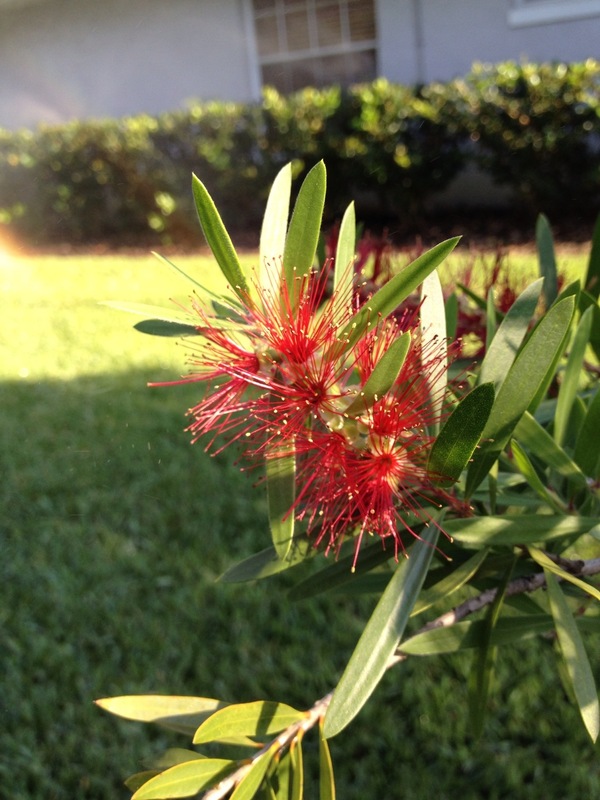 The next few pictures show flowers located elsewhere in my yard. 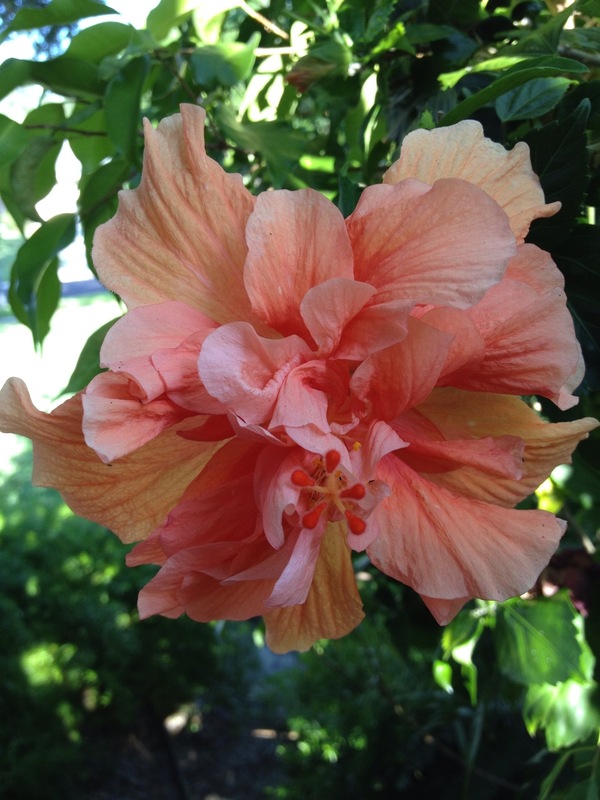 First is a double hibiscus. Nearly all the hibiscus I have growing are the scarlet variety; I just happen to like this one because it’s so unusual. 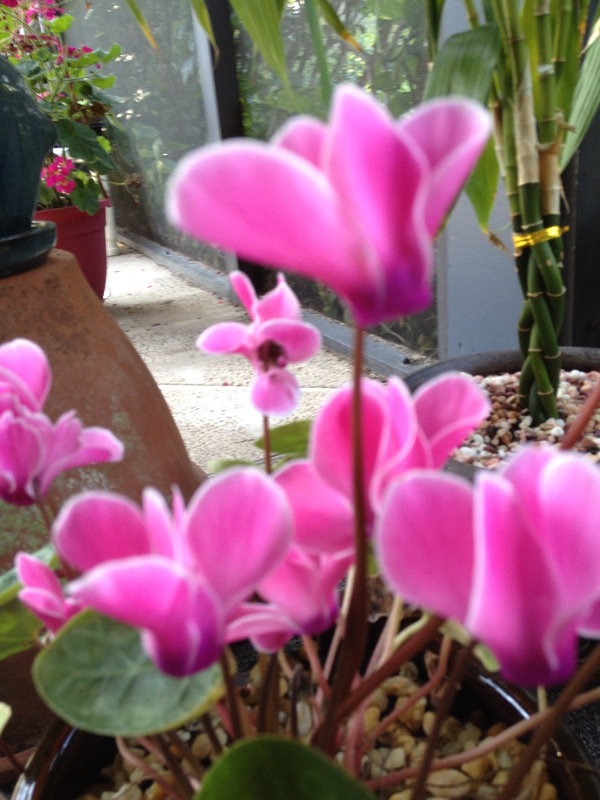 I don’t even know the name of the color. 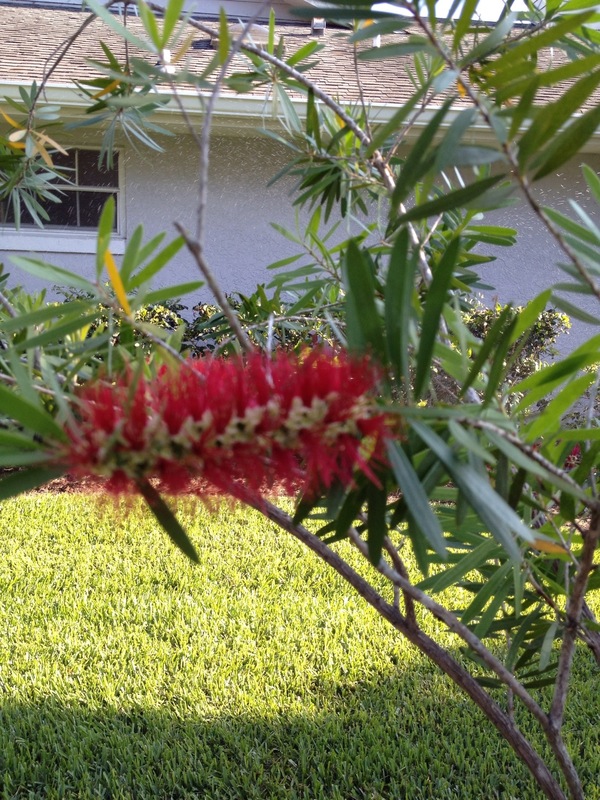 The second and third pictures are of different flowers on a bottlebrush tree. We only get hummingbirds here for a few months during the winter, so if I’m lucky enough to have it in bloom then, I’m hoping it will attract some. The next picture below is of a relative newcomer to our yard. 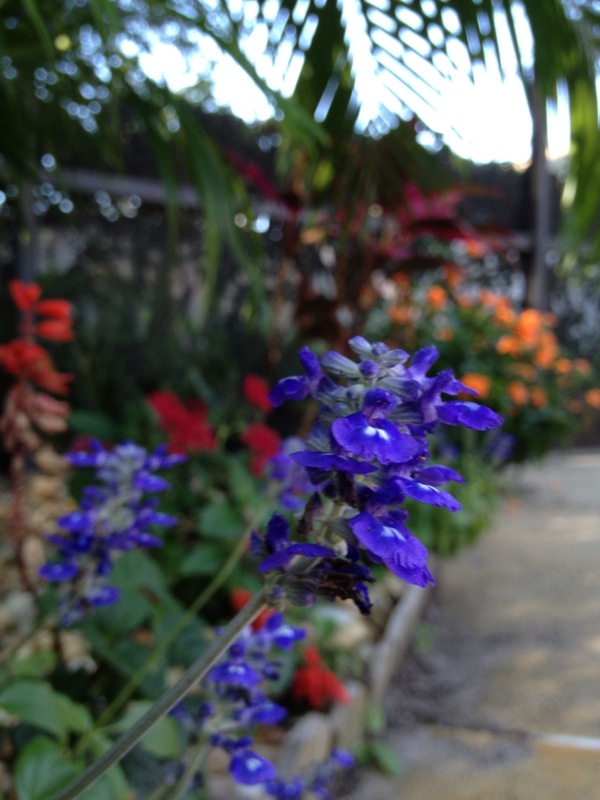 We planted several of these to fill in the space along the entranceway to our front door. They should spread nicely to fill in the space over the next few months. What you can’t tell from this picture is that the underside of each leaf is actually black. It gives the plant a rather striking appearance. 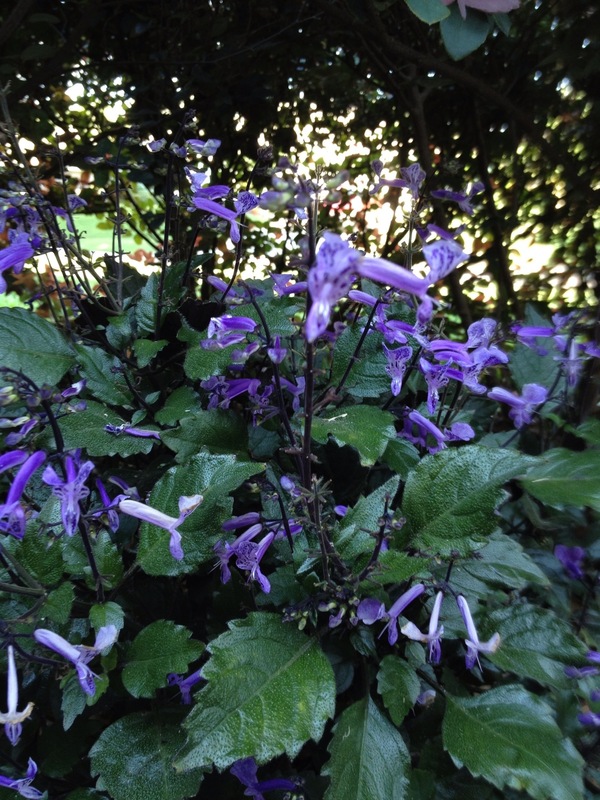 This plant is known as a Plectranthus Mona Lavender. Lastly, since this is the beginning of the three-day Memorial Day weekend here in the United States, which marks the traditional psychological start of summer, I’ll leave you with a sampler assortment from the container garden found around our pool. I wish everyone a safe and enjoyable holiday, but most of all, please take some time to remember why we have this holiday in the first place. It is because of the sacrifices of those whom we honor that we are able to enjoy our simple pleasures.